New KGCCI President Stefan Halusa (6th from right) poses with its members after he was elected its new president at its 34th annujal general meeting held on April 28, 2015. 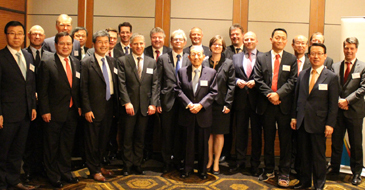 Mr. Stefan Halusa, president and representative director of German automotive supplier Brose Korea Ltd., was elected as new president of KGCCI at .the34th Annual General Meeting of the Korean-German Chamber of Commerce and Industry (KGCCI) held on April 28, 2015, KGCCI announced in its news release. Mr. Halusa, prior to his new assignment as KGCCI president, has been working in his capacity as president of Brose Korea for four years and has served as member of the KGCCI board for two years. 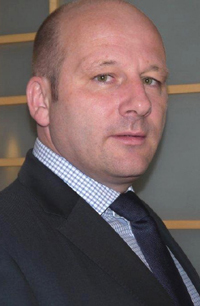 He succeeds Mr. Thomas Geyer, president of Vector Korea, who served as KGCCI President from April 2013 to April 2015. Mr. Kim Tae-Hyung, Executive Vice President of GS Global Corp., was elected as Vice President and Mr. Ludwig Feuchtmeyer, CFO of Continental Automotive Electronics, was elected as the new KGCCI Treasurer. KGCCI members also elected five new Korean board members: Mr. Kyu-Moon Ahn, President and CEO of Miele Korea, Mr. Ki Young Bae, President & CEO of The Class Hyosung Corp., Mr. Dai Woo Han, Senior Advisor at Bae, Kim & Lee, Mr. Haedong Kim, Managing Director of B. Braun Korea, and Mr. Dohyon Kim, Vice President Global Public Affairs Group of Samsung Electronics. As new German board members, Mr. Bernd Gehlen, CFO of BASF Korea, Mr. Torsten Kessler, Vice President of Deutsche Bank AG Seoul Branch, Mr. Dirk van Niekerk, President & CEO of Boehringer Ingelheim Korea, Dr. Frank Schaefers, President of Robert Bosch Korea, and Mr. Johannes Thammer, Managing Director of Audi Volkswagen Korea, were elected. Upon his election Mr. Halusa thanked the KGCCI team for their successful work in 2014 and pledged to do his best to support both KGCCI and Korean-German business cooperation.